"Yeah, But Gold Doesn't Pay Any Interest!" 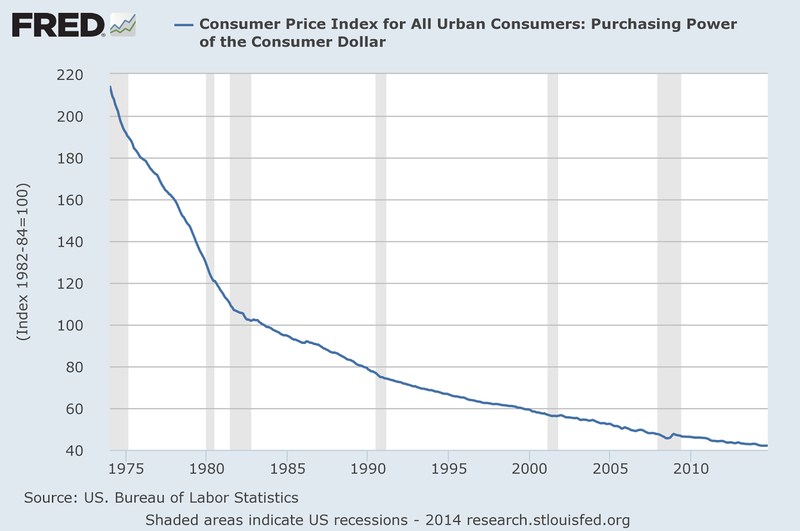 Courtesy of our friends at the Federal Reserve Economic Data (FRED) division, pictured above is the Purchasing Power of the Consumer Dollar. 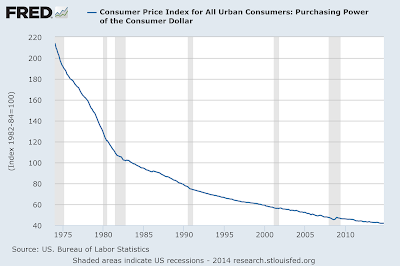 Essentially from 1975, the US Dollar has lost more than 95% of its purchasing power. As those who like to Invest Like A Farmer, we don't like losing purchasing power. It is a really bad thing; you receive less and less in terms of goods and services over time for each US Dollar you save. Traditionally this was offset by having FDIC-insured risk-free savings accounts that yielded interest. With interest now completely laughable, in some countries it is even NEGATIVE now (meaning you pay the bank for the pleasure of them then lending your money,) savers either have to chase risk in the hopes of getting a higher return on their dollars or seek an alternative asset class to hold their fiat currency. Although having seed capital available has always been a good idea, the mechanism of value in which that capital is stored is very important. Holding cash money long-term has proven to be a big-time loser for protecting the purchasing power of consumers.